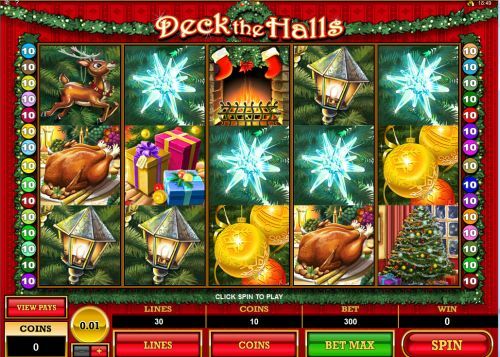 Deck the Halls is a 5 reel, 30 line video slot game that will really put you in the Christmas Spirit and you may also win enough to buy all of your Christmas gifts while playing this game. This game uses Microgaming Software to allow players a great Slots experience hanks to Microgaming’s smooth and fast running ability. Great symbols in Deck The Halls and they defiantly suit this game perfectly. They symbols include: Deck The Halls, Santa Claus, Christmas Tree, Turkey, Snowflake Ornaments, Bells and many more. There is a quick “Bet Max” feature to save players time and there is also an Auto Play feature. Both of these are great and handy to just get right down to winning some money. To enjoy the Deck the Halls Video Slot all you have to do is head to Luxury Casino(Doesn't accept Americans - get $25 No Deposit for Christmas at US-Friendly Classy Coin instead.). Your first step is to download the Luxury Casino which is free quick and easy. After the casino has finished downloading you will need to register which is also quick, easy and free. Also Luxury Casino has some amazing Bonuses available or new players. They will give new players a $1000 bonus on their first 5 deposits, yes that right a free $1000. Once downloaded and registered you are ready to go. On the main screen you will see 10 icons representing each form of game the casino has to offer so you will now be choosing the Video Slots Icon. You’ll notice that he Slot games have been broken down into 5 different categories based on various things but you will now be clicking on the 20+ Line option since Deck The Halls has 30 lines. From there the games are listed alphabetically so scroll or click until you see Deck The Halls and then it’s time to get playing. Deck the Halls is a great game for the casual player thanks to the very reasonable betting limits. Players can bet as little as a penny per game or up to as much as $15.00. So a very affordable video slot game for players but still enough can be bet to win a huge amount of money. Once you first start playing the game they will show you a great Christmas clip that will for sure have you in the mood for Christmas. Once you are through the short clip you are now ready to get doing what you came here to do and that’s play a fun Christmas slot game. This game is very easy to play so all players will not have a problem understanding what to do. All the buttons are listed with their function at the bottom of the screen. The Deck The Halls symbol is the highest paying symbol in this game. If you are able to land 5 of these on one of the paylines that you are using then you will win the jackpot. This symbol also works as a wild symbol. The Bell symbols act as the scatter symbols for Deck The Halls. If you are able to hit 3 or more bells anywhere on the reels you will win 10 Free Spins with a 2X multiplier. During the free spins you will increase your multiplier with a Deck The Halls symbol. You have a chance to win a huge amount of money with this game. Auto play and Max Bet are nice features to speed up the gameplay so you can can avoid the hassle of resetting your bet each game. If you want to play a Christmas game then be sure to give Deck The Halls a shot at Luxury Casino(Doesn't accept Americans - get $25 No Deposit for Christmas at US-Friendly Classy Coin instead.). It’s a very solid option for Slot players.